We left Mexico City around 6 a.m., and as we got stuck in traffic on the way out of the city I began to drift off in the back seat. 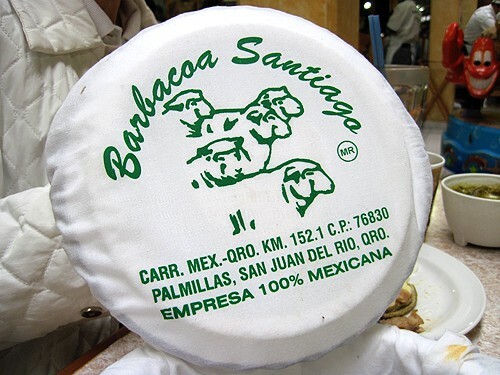 When I awoke, we were pulling off the highway and onto a gravel driveway that was packed with cars and people who all had the same motivation as ours: barbacoa for breakfast at Barbacoa Santiago. 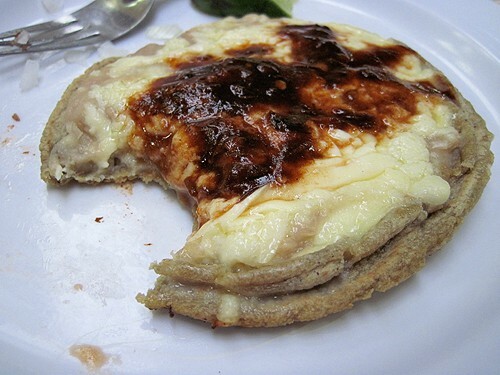 We ordered a plate of sopes to start, and they were like none I had ever tasted before. With very light-colored beans and topped with onions and cheese, I smeared some of the smoky and sweet salsa made with chile pasilla on top. It took an incredible amount of control to not devour the entire thing immediately. I managed to get one small bite before my suegro asked if I was going to take pictures. Both foiled and saved by my affinity for photographing everything we eat – everyone in our family usually pauses before taking the first bite to ask if I want to take a picture first. 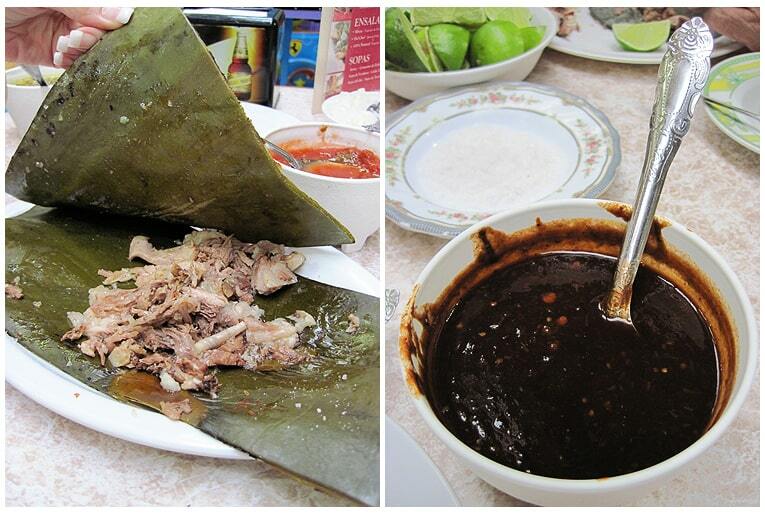 Then, sandwiched between two hojas de maguey, the coveted barbacoa arrived. The feeling when I took my first bite was like a choir of angels singing. I am not making this up. It actually tasted heaven-sent. Right then and there, I pledged my love for highway barbacoa and began devising a plan to return for more. Our bellies full and content, we finished every last bite and headed back onto the highway. One more small stop, I was told, before we’d continue on to Aguascalientes. When José was a little boy, my suegros used to take him on holiday to Hacienda Galindo to celebrate Christmas. This beautiful and breathtaking hacienda was built by Hernán Cortés in the 16th century and given as a gift to La Malinche (also known as Doña Marina after Cortés converted her to Christianity and baptized her), an indigenous woman who had been his interpreter, confidant, lover and the mother of his son, Martín. 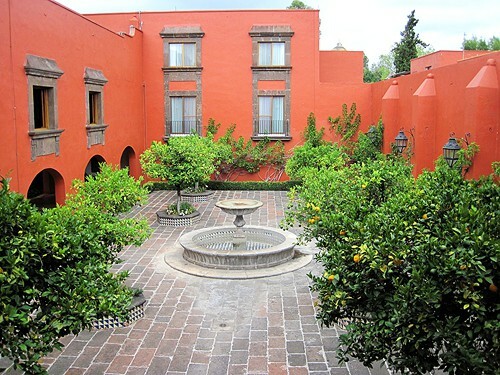 Peppered with fountains and courtyards, vibrant colors, flowers and vines, citrus trees and agave plants, it’s easy to imagine why Cortés would have given his mistress and son this place as a gift. There are also horses and stables, a chapel and bugambilias as far as the eye can see. Today, Hacienda Galindo is part of the Fiesta Americana Hotels and Resorts chain, but they’ve done a spectacular job preserving it and we stopped in for a visit so José’s parents could show me around. When he was just a toddler, there was a big, dark oil painting at the end of the main hallway inside that my suegros lovingly refer to as “El Conde.” According to the stories they’ve told me, José was apparently terrified of this painting and would not walk by it. We wandered the halls of the hotel looking for El Conde (The Count) but, sadly, could not find him. Instead, at the end of the last hall we searched, we found a window with a view of this quiet courtyard filled with citrus trees. We headed back to the car and decided we’d have to come back for an extended stay another time to find our beloved El Conde. Back onto the carretera, we headed toward Aguascalientes. 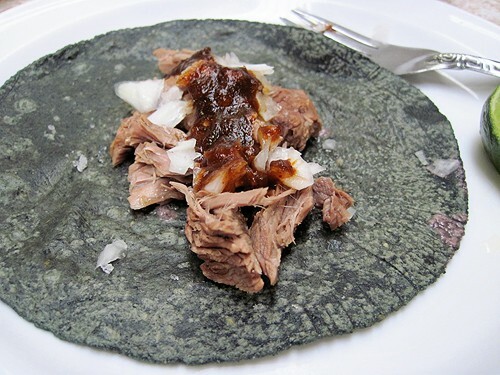 How do you like your barbacoa? Where’s the best barbacoa you’ve ever eaten? Mmmm barbacoa. My weakness. My favorite is a quesadilla de barbacoa at a truck that parks in an abandoned gas station in Hollywood. When I lived there I would eat it a few times a week. Served with fresh guacamole, crema & salsa. When I was pregnant I would drive across town and get two – one to eat at the truck while sitting on a milk crate & one wrapped in foil to take home. There is also a restaurant here in Venice that makes a good barbacoa served straight up with beans, rice & tortillas.